Tax exempt status of Environment NGOs targeted. Are you a #FriendofFoE? 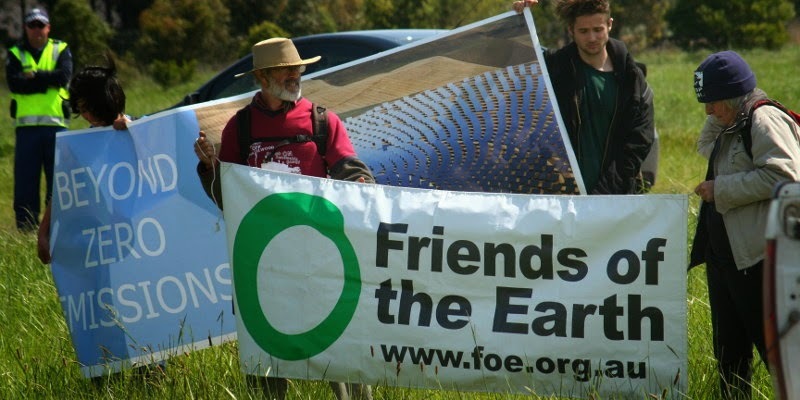 Australians do believe in a fair go and are willing to support in both unpaid time and money the ongoing environmental work and advocacy of these organisations. Millions of dollars is contributed each year by individuals to support a wide range of activities, including 'on the ground' work, education and training, grassroots activism and protests, and political advocacy. Cam Walker from Friends of the Earth outlined the threat on the ABC 7.30 Report (Environmental groups face tax deductibility loss in Government push): "I think like every environmental organisation across the country that employs staff, tax deductibility is the lifeblood of our organisation. So if the Federal Government is successful at getting through its attempts to cut off groups from the register, it will basically mean the political death of our organisation." In December 2013 the Attorney General George Brandis stripped all federal funding from Environmental Defender's Office's around Australia, in an effort to curtail disruption to mining and development being raised on conservation and environmental grounds through the court system. This was one of the requests of the Mining Council of Australia. Small conservation groups often use the Environmental Defender's Office legal team to challenge inappropriate development. With the support of the not-for-profit and charities sector, the Gillard Labor Government established an independant regulator for the sector in December 2012 - the Australian Charities and Not-for-profits Commission (ACNC) - to supervise and assist the voluntary sector consisting of about 600,000 organisations and associations, and track and review the approximately 56,000 non-profit organisations with tax-exempt status. The ACNC registers organisations as charities, assists them to meet their public obligations, and reviews activities for tax-exempt status as part of it's regulatory role. It does on occasion revoke tax exemption status if an organisation's activities are not aligned with charitable purpose and for the benefit of the public. Most recently it listed the 'Get Rid of Sids' organisation for revocation of it's status. The Abbott Government wanted to abolish the ACNC, but has not had the support of cross-benchers in the Senate to pass the necessary legislation. The assistant treasurer Josh Frydenberg said that although the Government had not abandoned it's aim to scrap the ACNC, it has now been given a low priority, according to a Guardian report. The Government is now changing tack, increasing it's pressure to silence the political advocacy work of environmental organisations by threatening their tax exempt status. A Federal parliamentary inquiry under the chair of Alex Hawke MP has been established by the Standing Committee on the Environment on the Register of Environmental Organisations. The terms of reference include a review of the definition of environmental organisation and the requirements to be met to be listed on the register. They also suggest the work of environmental organisations will be judged by the extent of 'on-ground environmental works' as ‘appropriate’ activity, with advocacy, activism and protest denigrated. Alex Hawke MP commented on the 7.30 Report that Green groups "need to be subject to the same accountability and transparency as other sectors", yet that is precisely what the ACNC does without any overt ideological and political bias. Joan Staples, Visiting Fellow in the Faculty of Law at UNSW Australia and a Vice-President, Environment Victoria outlined the series of attacks on environment organisations in a post at the Conversation in August 2014 (Step by step, conservative forces move to silence NGOs' voices). And while the tax exemption status of environmental organisations is threatened, the right-wing Institute of Public Affairs tax exemption status continues to draw funds from business groups and individuals, much of it hidden from public view. In 2012 Clive Hamilton, Professor of Public Ethics at Charles Sturt University, highlighted the shadowy nature of IPA finances and expenditure and called upon the Tax commissioner to "open up the Institute's books to ensure it is complying with the law and to force on the IPA the transparency it demands of others." Let's get this straight, environmental organisations act for the community benefit in making government and business more accountable for their decisions affecting the environment. Whether it be challenging mining exploration and development, industrial development applications, threats to native species and biodiversity, or a safe climate, these are important roles to be supported through tax exempt donations. The advocacy and political activism of environmental organisation is sorely needed to counteract those who prioritise economic growth and profit over community values and environmental sustainability.